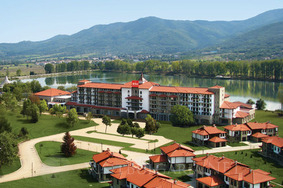 Location: Hotel "RIU Pravets Resort" is located on the lake in the pleasant town of Pravets, just 40 minutes drive from Sofia. Accommodation: It is a luxury Resort with a total of 242 units – 212 rooms, 10 Studios and an Executive floor with 10 rooms, 6 One-bedroom and 4 Two-bedroom Suites offering all features and services to satisfy the most demanding requirements of the leisure and business traveler. Wine & Dine: Two fine restaurants, the Lobby Bar and a stylish Piano Bar offer the hotel guests a wide range of culinary temptations and drinks. Sports & recreation: On the hotel’s premises there are a Fitness Centre and relaxation area, equipped with ultramodern technology. The Spa centre offers a variety of healing therapies and massages, steam baths and saunas that are unique for Bulgaria. An indoor swimming pool, decorated entirely with natural materials completes this true paradise for body and soul. The proximity of Pravets Sports Complex (with multifunctional sports hall, 3 football fields, 4 basketball and volleyball playgrounds and 3 tennis courts) is a great opportunity for camping and training of sport teams. Entertainment: Hotel guests can enjoy the casino and the emblematic Night Club “Shatra” in the evenings, or simply sunbathe by the open air Olympic-size swimming pool during the hot summer days. Spa & Wellness: The wellness and SPA area of the hotel covers an area of over 3000 sq.m. Merging the past with the ultramodern, it has taken the best of modern beauty treatments and techniques, combined with the ancient traditions of bathing , that provide a wide range of treatments and services giving you the feeling of complete body and soul relaxation. The Spa centre features a great number of facilities and services such as Salt steam bath, Herbal bath, Salt lake cave, Rock Sauna, Bio Sauna, Laconium, Tepidarium, Lifestyle Showers, ice room, Russian sauna a variety of traditional and exotic massages, Jacuzzis, state-of-the-art fitness center, and large relaxation area. The indoor swimming pool completes this true wellness paradise. The surrounding area is ideal for riding and cycle touring, with its beautiful meadows and gentle slopes. Conference facilities: The complex is designed in an elegant combination of ethno and modern elements. With different meeting rooms, equipped with state-of-the-art technology, it is suitable for seminars, meetings and conferences with capacity from 10 to 400 persons. Photo safari in the nearby Game station, as well and walks and picknick on Brusen dam. The region offers many attractions for everyone. All guests will be enchanted by the diveristy of plant and animal species hidden by the forest. Those who enjoy cycling can take advantage of the bysicles for rent provided by the hotel. A bysicle ride to Pravets would complete an excellent spring day. Developed especially for the youngest guests by a team of professionals and is a high quality conception for child animation. The complex presents a new and attractive program for entertainment and activities for children between 4-12 years old. The program offers a great variety of incredible dynamics, collective spirit and educational approach. RIU Land teaches children to love nature! Most of the activities are taking place outside among the fantastic greenery of RIU Pravets Golf and Spa resort. You can trust the professional animators of the complex and enjoy a real holiday, while your kids are having fun. The children animation program RIU Land is a compliment to all of the guests of RIU Pravets Golf and Spa complex. It is free, available without preliminary demand and all little friends are welcome.